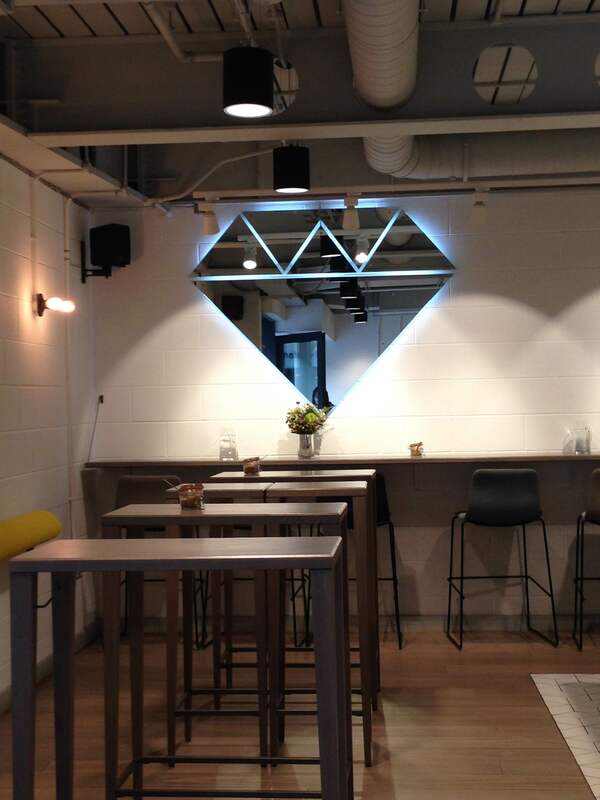 The brand identifier of Workshop coffee is a diamond, a representation of which hangs on the wall as soon as you enter the Holborn branch. I had arrived at Workshop in order to try their coffee after I’d had a great espresso made with beans roasted by Workshop at Knockbox in Lamb’s Conduit Street. The coffee brewed in their own café certainly did not disappoint. I enjoyed a very good La Soledad filter coffee and a cake (which was confidently nut free, this brings me to another plus point for Workshop, they know the ingredients of their cakes!). 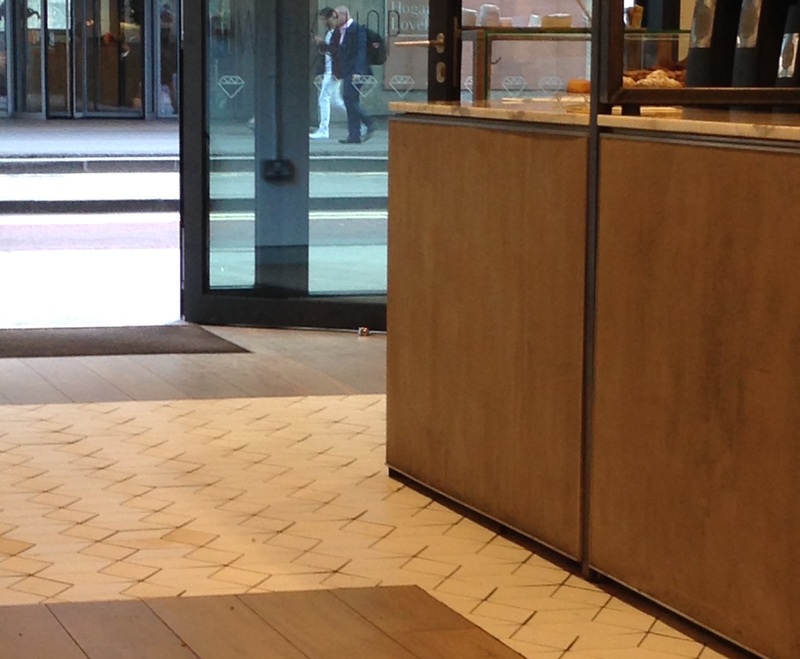 The interior of the cafe, just beside Holborn Viaduct, is quite spacious and, if you sit at the back, you get a great view of the workings of the espresso machine as different people come in to get their ‘take out’ coffee. It is very possible to spend quite some time here in order to relax and enjoy your coffee while taking in your surroundings. To a physicist who studies materials (like me), the diamond logo of Workshop represents a fantastic material. A material in which the structure of the crystal determines so much about its properties. Were the carbon atoms in diamond bonded slightly differently, they would form the soft, pencil lead material ‘graphite’, rather than the hard, transparent material of diamond. The floor at Workshop reminds me of my crystallography text books. Whether it was intentional or not, the crystal theme of the logo was replicated in the floor tiling of the Holborn branch. Crystallography is a branch of science that probes the building blocks of solids. It reveals how the atoms that make up different solids are arranged to form the solid. The atoms could be arranged in a simple cubic arrangement (as with salt) or hexagonally (as is the case for graphite). To establish the crystal structure you need to find the smallest repeating unit in the whole. Many introductory solid state physics or crystallography text books use 2D examples of repeating structures to help the student to understand how to build up these “unit cells” into full blown crystals. Many of the examples of such lattices look stunningly similar to the floor at Workshop. Fundamentally, the idea of the crystal is that it is a simple repeating structure, just like the floor of Workshop. Indeed, the word “crystal” as used by Pythagoras implied perfection, harmony and beauty, a sense that is really conveyed by the crystal structure of the diamond logo of Workshop. 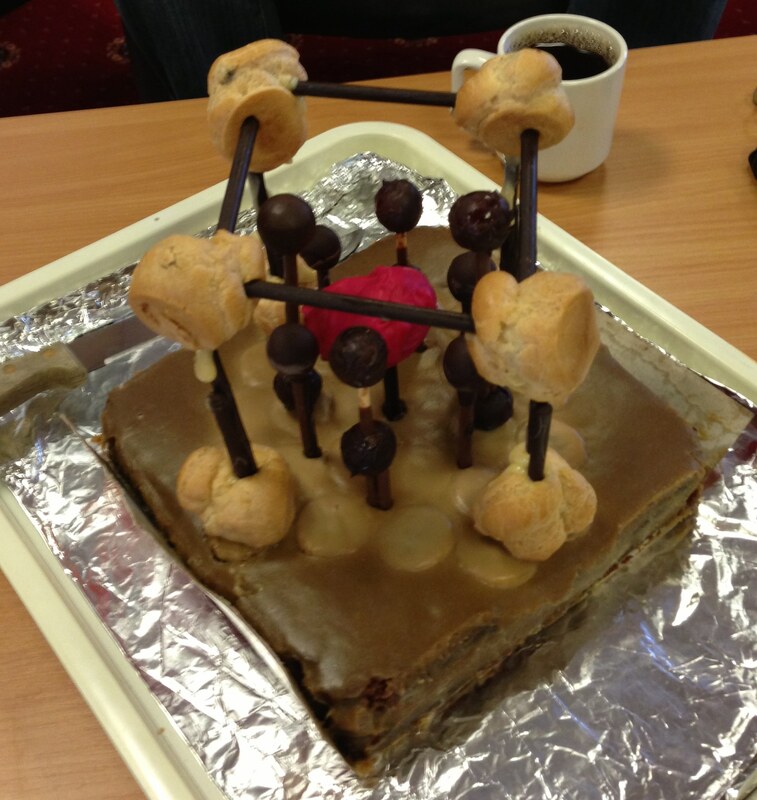 When a colleague left our lab, we made her a cake that was a representation of part of the crystal structure of the material that she had worked on. Chocolate grapes and profiteroles represent different atoms in the structure. The ancient Greek term for “crystal” actually implied the type of hard ice that is wonderfully clear and transparent. And it is ice that connects the area surrounding Workshop with a famous chemist who won a Nobel prize for his work in crystallography in 1962. Max Perutz (1914-2002) described crystallography as a technique that “explains why diamond is hard and wax is soft, why graphite writes on paper and silk is strong”. Once you have enjoyed your coffee at Workshop, if you head down the stairs on the viaduct and descend to Farringdon Road you quickly get to Smithfield Market. It was here that, during the Second World War, Perutz helped to develop the material Pykrete. A “secret weapon” of World War II, Pykrete was developed five floors below Smithfield Market in a room cunningly disguised with animal carcasses. The planners in the war effort had wanted to design a boat made of ice but the problem was that when it was shot at, ice shattered. Could scientists develop a type of ice that would not shatter if it got hit by enemy fire? Pykrete was the answer. Pykrete uses the fact that materials such as plastics can be strengthened by adding fibres to them. In the case of Pykrete the “fibres” were sawdust and the material to be strengthened was ice. Not only does it not shatter when shot at (instead, the bullet creates a crater in the ‘boat’), it takes a lot longer to melt than ordinary ice. The sawdust encased in the ice acts to insulate the ice and increase its longevity. Perutz’s Nobel prize was for his work to determine the crystal structure of haemoglobin, it took ‘just’ 25 years to do so. The field of crystallography continues to enrich our understanding of the behaviour of solids, though now we’re expected to get results more quickly than the 25 year time frame Perutz enjoyed. If you know of a good café where lots of physics goes on, or of a good café near a site of special (or unexpected) scientific interest, (or even just a good café) please do share your story either in the comments section below or by contacting me on email, Twitter or Facebook.